The signs of technological addiction are all around us. People sleep with their cells phone by their bed and consult them immediately upon waking. When you board a public transportation vehicle, kill time in an airplane terminal, or sit in a doctor’s waiting room, it seems like the vast majority of those around you are glued to their cell phones. Taken to the extreme, we have seen numerous instances of distracted cell phone users walking into light polls, walking in front of oncoming traffic and even walking off cliffs. Teens are urged to take no-texting-while-driving pledges, to cut down on unneeded accidents and deaths. 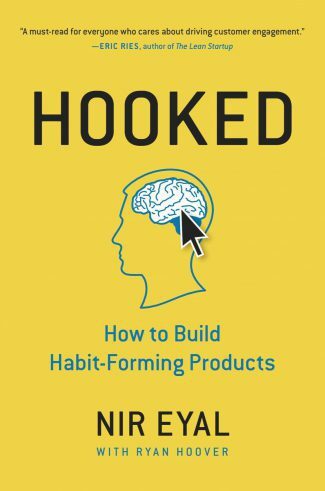 I read this book with the goal of understanding how products are made to be purposefully addictive, so I could identify them and reduce the likelihood I’d get sucked in. This review is written with that concern in mind. The process by which products and services cause us to develop a habit-forming relationship with them is called the Hook Model, which encompasses four phases: the Trigger, Action, Variable Reward and Investment. Trigger: The trigger is the spark plug that gets everything started. They come in many forms. Overt commercial triggers are commercials on TV, billboard advertisements, radio ad spots and emails or spam. Less overt triggers, but powerful triggers nonetheless, are notifications that your son or daughter just posted photos of your granddaughter’s birthday party on Facebook, or that a work colleague or friend just updated his Linked-In profile and has started a new job. These triggers remind you about something you’re interested in or curious about, and you take action to solve that curiosity or interest. Action: Having been stimulated in some way, you act on that stimulation. Based on our prior examples, this would entail logging into Facebook to see your granddaughter’s birthday photos or into Linked In to see where your friend is now working. Variable Reward: You took that action because you wanted something. You had an “itch,” and the variable reward will be your “scratch.” You wanted to see the beautiful person your granddaughter is growing into, and how happy she was during her fabulous birthday celebration, or whether James actually got that dream job he’s always been wanting. There’s more nuance to these four phases than what I just presented. But now that you have the overall structure, let’s flesh them out further. I’m going to take them out of order. Since everything is done to get the variable reward, let’s start there first. More on Variable Reward: Who doesn’t like a reward? Rewards are why we get up and go to work every day, because that paycheck enables us to buy ourselves things that we want and crave (in addition to allowing us to pay for our basic living expenses, which in itself is a reward.) But rewards are not always luxury cars or Gucci handbags. In fact, with regard to the Internet and smartphones, rewards are frequently small and intangible. Examples of small variable rewards include navigating to your favorite news website to see if there are any articles of interest or new developments, or putting a coin into a slot machine to see if you’re the lucky winner of a large jackpot. It is for the reward that we do a lot of things, and rewards come in all shapes and sizes. Because humans are somewhat complex creatures with varying needs and desires, we seek rewards for different reasons. Generally, however, we seek rewards that fall into one of three main categories: rewards of the tribe, rewards of the hunt and rewards of the self. Rewards of the Tribe: “We are a species that depends upon one another. Rewards of the tribe, or social rewards, are driven by our connectedness with other people.” Therefore, we do things online that reinforce our acceptance by others and inclusion into groups. Social media, in particular, reinforces this need as every “like,” post, and tweet by our friends, directed to us and others, reminds us that we are accepted into a group. Checking email often fulfills this need, too, since the receipt of an electronic communication from a friend or family member reassures us of our social inclusion. Furthermore, knowledge and content sharing websites (often times in the context of professional associations or hobby interests) in which users make major investments of time to educate or assist others, with no corresponding financial compensation, are driven by the reward of the tribe. The earning of badges, titles of respect, or large numbers of users on these sites voting that your response was the most helpful connotes a social respect or status which reinforces our altruistic nature and encourages further participation. Rewards of the Hunt: The human species has flourished because at some point in our evolutionary development we transitioned from eating plants and vegetables to hunting and trapping animals, whose protein content enabled us to grow stronger and proliferate further than would have otherwise been possible. As a result, “the need to acquire physical objects, such as food and other supplies that aid our survival, is part of our brain’s operating system.” Mr. Eyal cites machine gambling (slot machines) as being very attractive to a segment of the population, for this reason, notwithstanding the fact that most players realize the casino has an advantage and will win over the long run. Non-financial examples of the hunt includes Twitter and Pinterest, where mundane tweets and photos are mixed in with other items that we find particularly interesting. Users of these sites are incentivized to continue clicking and scrolling through more content in the hopes of uncovering the next “gem” they’re seeking (whatever that might be.) Bargain hunting, such as on eBay, is also a modern activity providing enjoyment to many shoppers through a hunting process with variable rewards. Rewards of the Self: Finally, there are rewards that we seek for no other reason than a personal sense of achievement or accomplishment. A segment of the population chooses to assemble large jigsaw puzzles which may take days or weeks to complete and possibly involve a bit of frustration along the way. The end result is not terribly tangible, because the puzzle is almost always disassembled and put back into its box, but we do this for the feeling of achievement and competency the puzzle’s completion gives us. Likewise, a segment of the population needs a certain level of tidiness in their lives, and this drives them to constantly monitor, sort, file and organize their email inboxes to strive for the goal that all emails have been properly read and filed (“a near-mystical state” referred to as “inbox-zero.”) Mastering our inbox gives us a sense of control, which is satisfying to many. Finally, the reward should be variable. There is an excitement factor when you don’t know the outcome from your next website click or gambling bet that you wouldn’t have if you knew what the outcome was going to be ahead of time. This excitement factor is physical and measurable in the form of a chemical called dopamine that is produced in the pleasure center of your brain. This variability can also be found in not knowing what new emails will be in your email box when you log in, what new tweets might soon come in from Twitter, or what new posts or photos might be awaiting you from friends and family in Facebook, etc. More on Trigger: After the reward, I consider the trigger to be the next most important step in Hook Model, since it is the spark plug that gets the process rolling. It is also the area to which you might most want to pay attention if your objective is to identify potentially addicting situations in the hopes of minimizing or avoiding them. Triggers can be either external or internal. The goal of all marketers is to link their product or service to one of your internal triggers, which “manifest automatically in your mind.” “Emotions, particularly negative ones, are powerful internal triggers and greatly influence our daily routines. Feelings of boredom, loneliness, frustration, confusion, and indecisiveness often instigate a slight pain or irritation and prompt an almost instantaneous and often mindless action to quell the negative sensation.” With this in mind, it becomes much more clear (to me at least) why people are routinely found staring into their cell phones in certain settings. In a doctor’s office, faced with boredom, we turn to our cell phone for relief from the boredom. On a crowded bus or in a confined elevator, confronted with the social awkwardness of being surrounded by strangers, we may seek relief by burying ourselves in our cell phone and thereby not having to make eye contact or interact with those strangers around us. Or perhaps home, alone, at night, when feeling lonely, we might check our email or social media account to see if anyone cares about us. These are all subtle, but powerful, internal triggers that nudge us into using a product or service for relief, and it is the goal of product designers to find some way to associate or link their product with these various internal triggers. More on Action: Between the trigger and the reward is the action phase. With the objective of helping product designers build habit-forming products, Mr. Eyal spent considerable time recommending steps designers could take to make it more likely the user or potential user will take action after the trigger to receive the variable reward. In summary, product and service providers should greatly simplify what a user needs to do to get from the trigger to reward, with the least amount of clicks, typing or effort. Also, judiciously deciding when to request more information from a new user is important here, too. When you are new to a website or service and not sure if or how often you’ll return, you are not inclined to give much more information than your name and email address. Asking for home addresses, credit card numbers and other more sensitive information at that early stage is likely to alienate and lose potential users. But, after you’ve been sucked in and gotten more comfortable with the service, they can begin to stress the relationship by asking for payment or information you weren’t so willing to part with before. More on Investment: As previously discussed, having a user make an investment of time in the product or service helps to lock them in as a repeat customer. A good example of this is IKEA. Although the need to assemble IKEA’s furniture after purchase was primarily a by-product of IKEA’s goal to pack and ship their products in the most efficient manner possible, surveys have shown users like their IKEA furniture disproportionately more than competitors’ products because they have a bond with the furniture by virtue of the fact they invested their own time and labor to put it together. Tinder, Snapchat and Pinterest were also highlighted by the author as examples of services that required significant user involvement which translated into high switching costs and high levels of repeat usage. One other aspect of the investment phase is that a well-conceived and executed product will capitalize on that user’s investment to pre-load the next set of triggers. So, a positive match with a potential date on Tinder will require that user to return to the app to set up a time and place to meet that interested person. Likewise, a photo uploaded to Pinterest or Snapchat may generate compliments or comments from other users, which will then require you to log back into the site to see what people are saying about your masterpiece. The Hook Model, when operating perfectly, is a never-ending cycle that keeps bringing users back to the service through properly-timed triggers for never-ending variable rewards. I don’t anticipate that my online activities will change very much after reading this book. I was already somewhat careful about trying to not get sucked into time-consuming and habit-forming activities. At least now I have a better understanding of how these addicting processes work, and can be on the lookout for signs that I’m getting drawn deeper into an addictive product than I’d like. I hope this will help you make more informed decisions regarding potentially addictive products. Or, if you already think some Internet reduction would be beneficial, you can attempt to identify and avoid the triggers that repeatedly get you started on these never ending Hook cycles. Good luck!